Have you found an online vendor selling Bumbu Original? The owner of my local liquor store ( also a rum drinker ) showed me this rum. He had a open bottle for tasting because that is where this rum is special. Again just as the plantation pineapple this is a fruity rum. The rum itself is a pretty smooth sipper not to sweet, but then you get hit with a sweet wave of bananna. Cool experience and a definate contender for summertime cocktails! Tons of added sugar (sticky lips), added banana extract and vanilla extract, an ugly, childish bottle that screams 'themepark giftshop': this is a joke. 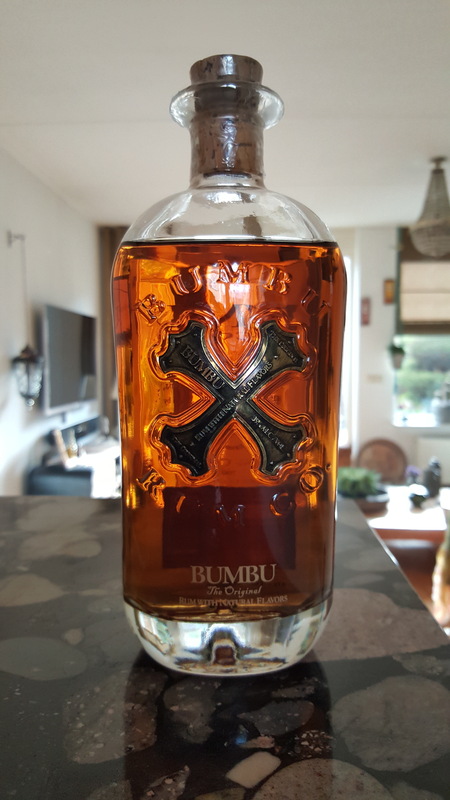 Those 'professional' reviewers on spirits/lifestyle-websites that say this is good rum have either been bribed by Bumbu or have no idea what rum really tastes like. This is not rum, this is a banana licqueur It is so sweet, I was sick after half a glass. Only if your diet consist of liters of sugary energy drinks - and your ability to discern anything but sweetness has long since died - could you appreciate this rum. It's a disgrace. I really liked this rum, except the added banana flavor. Might have been an '8' rating had they not added all that banana. Smells and tastes of banana, vanilla, sweet caramel, spice, nuts, and cinnamon. Not bad, except the banana flavor. :-p If you like natural banana in your rum, then you might like this a lot more than I did. This crap is overpriced and overloaded with an unnatural sweetness. There is strong smell of alcohol, vanilla extract, and banana laffy taffy as you lift your glass to take a sip. The body is weak and sugary with a finish that is chemical tasting sprinkled with peppered bananas. This stuff is only good for maybe making mixed party drinks. I can definitely see a bad hangover from over indulging in this one due to the high sugar content. Traditional rum drinkers this is a pass. There are A TON of better rums out there for $30+ that I paid for this one like appletons 12 year rare blend. Quite tasty, but overwhelmingly banana flavors hit you. If this was marketed as a dessert rum, or a banana liquor, it would be a different story. But it's a rum, and an eye-catching one at that. More of a sweet liquer than a rum. Too much banana, toi sweet and not enough depth or complexicity. Got this rum as a Christmas present from my kids, acting on a recommendation from our local liquor store - evidently they can't keep up with the demand! 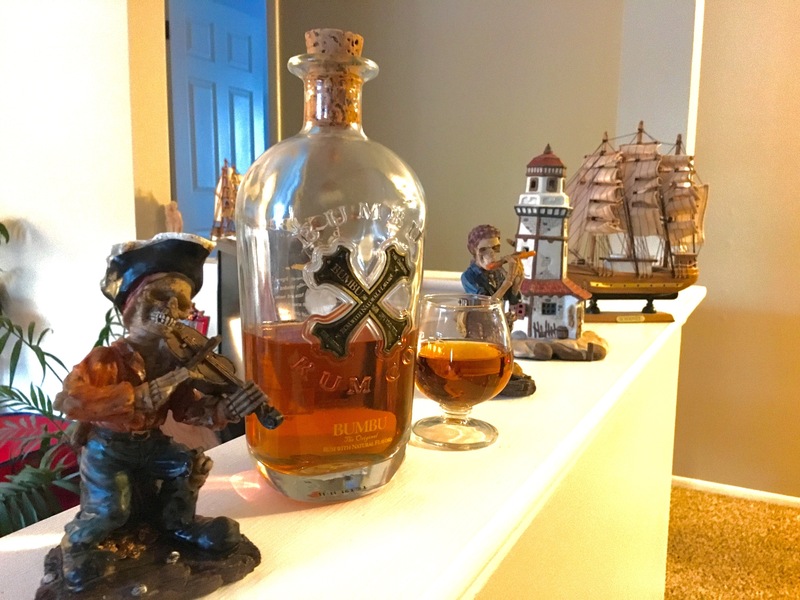 Very attractive presentation with pirate-like "X marks the spot" bottle design and a big cork stopper. The taste was notable, BIG banana flavour, will plenty of vanilla and caramel in the background, quite a sweetness to it, and very minimal finish with little after-burn. Very smooth, and the first glass was gone before I even realized it. I do agree with some of the "not like a true rum" reviews others have posted, but taken for what this is, which is more of a dessert drink or almost a liquor, this is a very nice addition to the bar, to be enjoyed straight up on a cold day. I tried this once. It's watery and sweet. The fact it's bottled at 35% to save on taxes yet costs as much as a premium blend is not forgivable. Stay away. When you see this is a 35, you know this is gonna get interesting. Its unique. I was surprised, but not pleasantly surprised. This is not rum. When you buy a rum, you buy a rum, and when you buy liqueur, spiced, flavoured and sweetened, you buy that. This is not an aged rum. This is a fruity (banana) flavoured alcoholic beverage, spices, caramel to taste, voila and banana on the nose. That being said its an excellent liqueur. Mixes quite well and ok on the rocks. Not a rum. Lager colored. Aroma is vanilla, honey, fried banana, Werther's Original. Taste goes to heavy vanilla, banana, cream fudge. 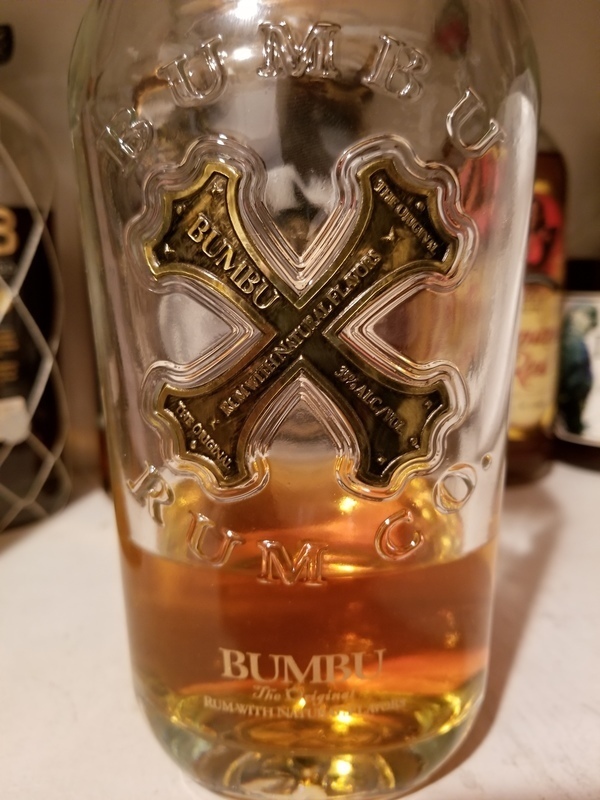 A complicated as this rum sounds as described on the Bumbu website it's hard to categorize it as either an aged rum or a spiced rum. So I call it both. According to their website: "Our rum is distilled using two continuous stills and aged up to 15 years in grade-A, once-used Kentucky bourbon barrels. The yeast used during fermentation is a distillery secret that dates back as far as 1840, when some of our original iron pot stills were cast." They also use sugarcane originating from several countries: Barbados, Belize, Brazil, Costa Rica, Dominican Republic, El Salvador, Guyana, and Honduras. The rum is distilled in Barbados which is my favorite country of origin for rum (Martinique being the others). BTW, this rum is in one of the coolest rum bottles I've ever seen. Looks like something Hollywood would come up with for a pirate movie. I uploaded a photo I took. The color in the snifter is a bright amber. It shows excellent legs as I swirl it around my snifter. A wonderful aroma comes from this rum...reminds me of baking vanilla cake from scratch. At 35% ABV (70 proof) it's a little less potent than typical rums. The flavor is very complex due mainly to the spices used. Self-described as "all-natural native spices and no artificial colors or flavors". There is a noticeable sweetness but I do not know if it has been sugared or if some of the flavoring brings the sweetness naturally. Either way the sweetness is not overpowering. Instead it adds to the overall experience. My palate is not very educated on detecting subtle flavors however vanilla seems to be one of the predominate ones. It's even noticeable in the aroma. Again, not overpowering. There seems to be some pepperiness and a bit of oak tannin as well. The tannin bitterness is rather mild. I also seem to detect coconut and fruit flavors (mango???). Very complex. And smooth. Definitely qualifies as a sipping rum especially in a beach chair at the beach. Or a lake. Or a river. Or a pond. Or a puddle of water. Doesn't matter. Even if you're nowhere near a beach this rum will take you there. I like this rum. A lot. Sugar: Off the charts at an estimated 45 -50 GPL. This is a rum liqueur and is only 35% ABV. It has an interesting bottle and I give that a point as it looks good on the shelf. As for taste it's very sweet and my opinion is that it tastes like Cream Soda or bananas with syrup. It's an after dinner rum for doing a quick shot of sugar caused you missed desert. Yeah it's gimmicky and not really a serious rum, and it's okay to have it in your bar even if it's just for the bottle. To sweet, to much added stuff, might be oke with coke but i don't even want to try, rum should be enjoyable without adding coke.. If you like your rum to taste like syrup with banana flavouring then this is for you, otherwise I'd stay away! I ended up using mine to soak rasins for baking with! Far too sweet and artificially flavoured for me! While actually pretty smooth sipping, the amount of sweetness/banana on the nose & palate are just a little too much. Will still drink it occasionally & it seems relatively popular with guests, so worth keeping on hand. Yep that's what you get with this rum a sweeeeeet , cloy, desert rum and well maybe a cavity or two . It looks like rum but it smells and tastes vanilla. Too much vanilla for sipping. The vanilla takes over your mouth. I would only have it for sweet drinks. This one was recommended to me in special store, but i regret i didn't smell it at least. It is 35% strong, it smells very artificial and tastes the same. There is some "fruit essence" added. How do I start. Confusion is the word that comes to my mind. After two tastings still don't know what to think. Very, I mean VERY sweet smell of bananas and allmost no alcohol. Judged by the smell you'd think it's a liqor. Drinking it you recognize rum at the very end only. A little burn and very thin legs. Strangely enough I still like it but I don't no exactly why. Maybe it's psychologically because the bottle is a jewel. I repeat, the bottle is the master of my cabinet! Die Flasche sieht richtig gut aus. Piraten Style. War auch mein Kaufentscheid. In der Nase: Frucht ? Grüner Apfel ? Nein jetzt eindeutig Banane ! Im Gaumen: Alles Banane ! Abgang: ? Was wohl ? Banane ! Sehr wohl ein süffiger und sehr süsser Rum, natürlich nicht nur Banane, auch Vanille, Karamell und mehr sind mit allen Sinnen zu erfahren. Eher als Dessert Rum zu trinken, 35 % Vol. The bottle looks really great. Pirate Style. Was also my purchase decision. In the nose: fruit? Green apple ? No, now clearly banana! In the mouth: All banana! Very much a tasty and very sweet rum, of course not only banana, but also vanilla, caramel and more are experienced with all senses. More likely to drink as a dessert rum, 35% Vol. What I like most when I look at my bottles is when I can call for a particular drink, such as I want a "bumbu and coke". Meaning that the rum itself has such a distinct flavor I can discern it from the others. That's what a truly good rum should be able to do. This rum is deep complicated and rich in a flavor not like anything I have had before kind of flavor either. Something like a banana-cinnamon. Now the only reason keeping me back from 10/10 is the fact it isn't 80 proof. It's 70 proof. Which makes it cheating a little compared to the other rums so I knock a point off. Extremely smooth. This could probably be used as a contact solution no problem, it's just that smooth. Extremely high value for price. Would recommend in any drinking combination.